“Celebrate America’s summertime tradition with 32 fintastic episodes... Shark Week is back, making a huge splash with all-new, compelling and jaw-dropping shark stories and shark technology. Working with the most respected marine biologists and science institutions, Shark Week: Shark ‘n’ Awe Collection highlights some of the most recent breakthroughs and developments that have led to remarkable new insights into these magnificent creatures.” That is the official description for the Shark Week: Shark ‘n’ Awe Collection available on DVD from Lionsgate, which has provided NewTechReview with a NFR copy for review. Despite the public’s fear of these fascinating sea creatures, the statistics don’t lie. According to National Geographic, only five people die from shark attacks yearly, and for every human killed by a shark, humans kill approximately two million sharks. It also states that most shark attacks occur less than 100 feet from the shore mainly around popular beaches, and this is the fact that interests me the most. Many beach goers seem to ignore the fact that swimming in the ocean can be dangerous and they believe that somehow sea creatures are less harmful than other wild creatures. If you wouldn’t want to come across a bear in the woods, why would you think a shark would be any different? All wild creatures are just trying to survive, and if provoked or frightened, they will attack. While the Shark Week: Shark ‘n’ Awe Collection does include shark attack incidents and interviews with some of the people who’ve been attacked, it also provides a balance of information by focusing on the actual facts and science pertaining to sharks. Every year we learn more about sharks... how they live, how they behave, and why they do the things they do. In the approximately 22 hours and 35 minutes of material included in this collection, you’ll see some of the best episodes from 2015 and 2016, which will prepare you for the upcoming 2017 season starting in July. Some highlights from the collection include Alien Sharks: Close Encounter (featuring sharks that glow in the dark and other strange varieties that can only be found in very deep water), Ninja Sharks (featuring some of the stranger ways that a shark can kill its prey, such as the shark with a knife-like tail), and Sharks Versus Dolphins: Face Off (examining how these creatures have shared the ocean for millions of years and still remain enemies to this day). We all fear what we don’t understand, and sharks are definitely ferocious looking creatures. However, if you follow the facts, sharks are no different from any other wild creature. 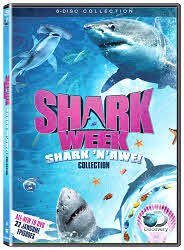 The Shark Week: Shark ‘n’ Awe Collection provides a fascinating and wonderful look into the world of these interesting creatures using facts and science, but also a bit of sensationalism to keep things entertaining. If you have any interest at all in one of the oldest living creatures on Earth, then you’ll enjoy this title.